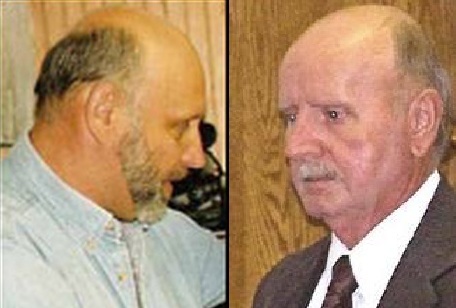 At least 6 children were ritually sexually assaulted by George Otis Johnston (right, sometimes identified as ‘Johnson’), the pastor of Grandview Valley Baptist Church North, and four elders at its sister church Grand Valley Independent Baptist Church: pastor Raymond Lambert (left), his wife Patty Lambert, and her brothers Paul and Tom Epling. All the children in Grandview Valley compound were homeschooled at the Grand Valley Christian Academy. Some of the abuse occurred while Johnston was tutoring one of the children in algebra. The abuse came to light in May 2006 when eight members of the commune walked away from the church with no money or physical belongings. One of the women told authorities about abuses that had taken place at the compound. In August 2006, the approximately 20 children who remained at the compound were taken into custody by social services. Johnston and the others were charged with a number of felonies; however, all of the charges were eventually dropped due to witnesses’ being unwilling to testify, the statute of limitations being invoked (some of the abuse had occurred in the 1970s and 1980s), and the victims’ desire to avoid further victimization in court.